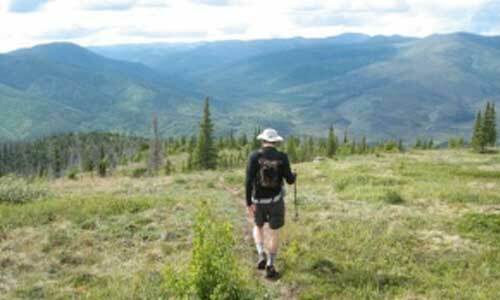 A good backpacking tent is an essential part of a backpacker’s outdoor equipment. It gives you protection from rain, wind, snow, and bugs. 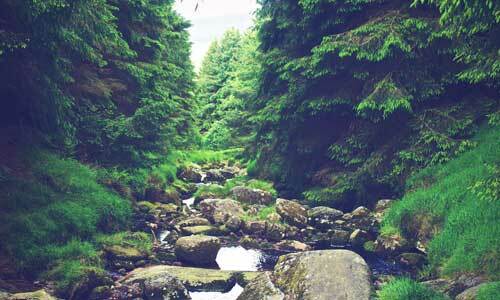 It also gives you a little privacy — sometimes a much-needed thing when you’re hiking with other people. 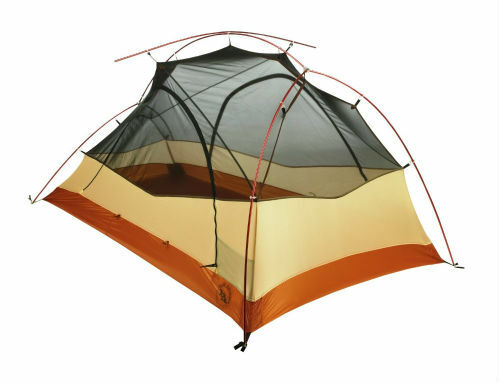 Backpacking tents come in many different shapes and sizes, and vary widely in price. It is important to think carefully about what your needs are before you buy one. The last thing you want is to spend several hundred dollars on a backpacking tent, only to discover that it is too small, too heavy, too flimsy, or too difficult to set up. The Big Agnes Fly Creek 1 is great for solo use. The first thing to consider is capacity — the number of people the tent is meant to hold. How many people do you plan to hike with? Pay attention to floor space — some “2 person backpacking tents” are really “2 thin, short persons who really like each other” tents! Generally speaking, 1 person tents range from 18-26 square feet, 2 person tents from 27-37 square feet, and 3 person tents from 38-50 square feet. Buy on the low end of this range if you are small and/or want the lightest backpacking tent possible. Buy on the higher end if you are larger or get claustrophobic in small spaces. 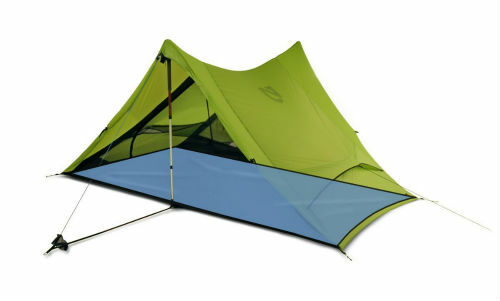 The Nemo Meta 2 is an ultralight tent. The weight of your backpacking tent will be more or less important depending on how often and how long your outdoor excursions are. If you only plan to go backpacking a few weekends a year, you can get by with a heavier tent. The advantage of having a heavier tent is that it will generally be cheaper, and also larger, than a lighter tent. 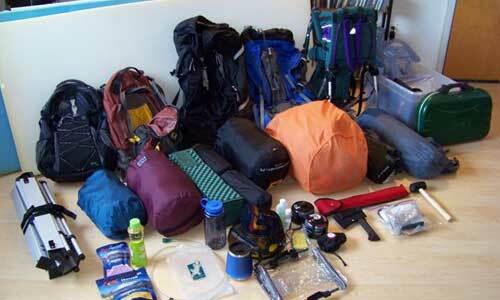 If you intend to backpack every chance you get, and for as long as possible, then weight is of primary importance. The comfort you give up by buying a good lightweight tent will be offset by the freedom of a lighter pack. Or maybe that’s not good enough for you. Are you ready to get ruthless about slashing weight? Ultralight tents have come a long way. Innovative designs and advanced fabrics make the new breed of ultralight tent nearly as spacious and durable as their lightweight brethren. Backpacking tents come in a bewildering array of shapes. Each has its advantages and disadvantages. The hoop or tunnel tent is a basic design that uses one or more “hoop” poles as the structural support. Since the poles are short, these tents are very lightweight. A good example of this is the Sierra Designs Flash 2 UL Tent. Unfortunately, hoop tents are not freestanding, so they must be carefully staked out to keep from sagging. Re-tightening the lines is often necessary. The A-frame design uses “A” shaped pole supports at both ends connected by a pole along the top. This design is mostly seen in very cheap or very heavy tents (which I don’t recommend for backpacking). Modified A-frame is a catch-all term describing a wide range of designs, from ultralight tents relying on trekking poles for support, to advanced hubbed-pole tents. Modified A-frame tents are generally very light, but they usually offer less living space because the sidewalls tend to sag in. An extra brow pole alleviates this problem. Dome tents have two or more crossed poles. They are very popular because they are freestanding, strong, stable, and easy to set up. They also tend to be heavier than the other styles. A single-wall tent has only one layer of fabric for a canopy. 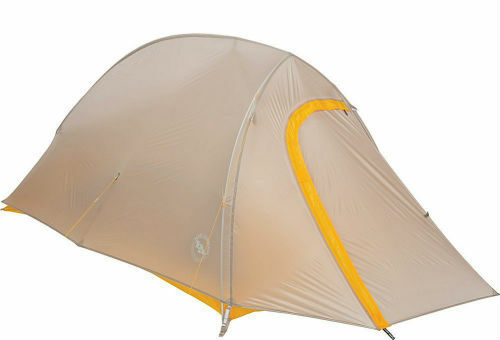 A double-wall tent has a body made of some combination of nylon and mesh fabric, with a waterproof rainfly as a canopy. Double-wall tents have many advantages. They are more versatile–on a warm, clear night, you can leave the rainfly off and do some star-gazing. They usually have a vestibule–a covered area under the rainfly but outside the tent body–where your shoes and backpack can be protected from the elements. Also, most double-wall tents ventilate well; in other words, they allow air to flow under the canopy and through the tent, keeping the moisture produced by body heat and respiration from condensing on the inside of the tent. The advantage of a single-wall tent is that it is much lighter than a double-wall. It is simpler to set up, too. However, many single-wall tents do not have a vestibule. Also, adequate ventilation is trickier with single-wall tents. They tend to collect more condensation on the inside. It is usually critical to position the tent according to wind direction to get maximum airflow. A few hybrid tents such as The North Face Vario are part single, part double-wall, capturing some of the advantages of each design. 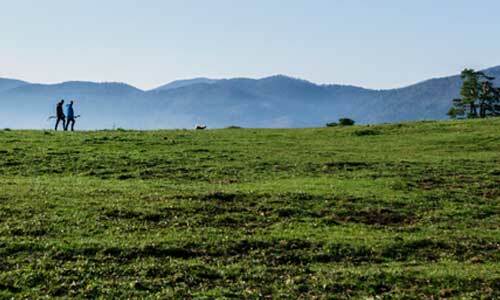 Most backpacking tents will claim to be for 3-season use; spring, summer, and fall. Take this with a grain of salt. A tent that performs wonderfully in the heat of summer is most likely not going to do well in the cold weather of early spring or late fall. The key is the amount of mesh in the tent body and the extent of rainfly coverage. A tent body that is mostly mesh will let more body heat (and condensation) escape–great for hot weather. Likewise, a tent body with very little mesh will hold in more body heat–better for cooler weather. Also, a rainfly that extends almost to the ground will keep in more heat than a smaller one. Since no one tent will perform perfectly in all seasons, you should look for the tent that will be most suitable for the range of temperatures in which you plan to do most of your hiking. Another thing to be aware of is that a tent with an all-mesh body, although very light and excellent for warm-weather use, will not keep out wind-driven sand. If you plan to camp along beaches, get one with a solid lower body and an extensive rainfly. Mountaineering tents are designed for extreme cold and snow. They are usually single-wall, with minimum ventilation and extra poles to support snow weight. They are generally heavy and don’t perform well in warm weather. Convertible tents have zip-off panels and extra poles which can be left behind in the summer to improve ventilation and save weight. Most backpacking tents are small and light. Camping tents are much larger and heavier. What if you like to camp and backpack, and don’t want to buy two tents? You can get a backpacking camping tent that will satisfy both needs. Be aware, though, that you will have to compromise a little on both weight and space. If you are new to backpacking and not sure how much of it you are going to do, get a good, cheap tent. You can find a great discount tent by looking in the right place. If you really enjoy backpacking and plan to do a lot of it, it’s worth spending more to get a well-designed, durable, lightweight tent that will last for years to come. Check out my picks for the best backpacking tent for some ideas. The tents listed on this website are the “cream of the crop”; the smartest, lightest, and cheapest you can find. However, there are hundreds more models available. If you want to do some serious, detailed backpacking tent comparisons, I recommend buying Backpacker Magazine’s Gear Guide (issued annually). They list specifications for hundreds of tent models, along with recommended tent reviews. Double-check the specs before buying, though; I have found several errors in the listings when doing my research. 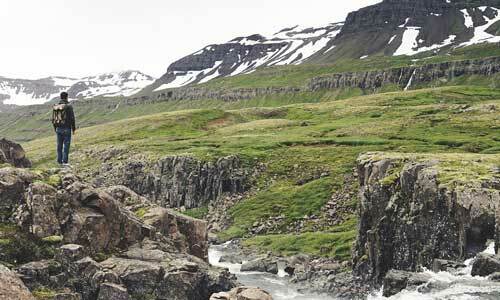 Before buying a backpacking tent online, go to your local outdoor store and see if they have what you are looking for. Set one up in the store and climb inside. This will give you a good “feel” for the tent — how easy it is to set up, how much space it offers, how durable the materials are. You may even get a better deal buying locally than online. Make sure your tent has a waterproof, bathtub floor. This means the seams connecting the floor to the body are raised a few inches off the ground so that moisture can’t seep through them. 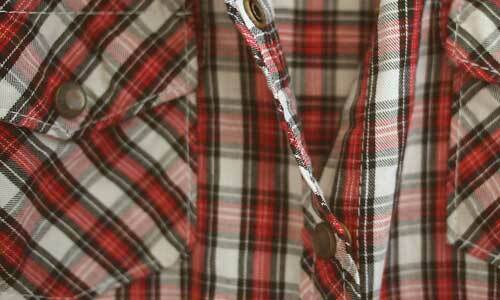 Also, check to see if the seams are pre-sealed. Usually they are; if they’re not, you will need to seal them yourself before using the tent. I highly recommend buying a footprint with your tent. Although you may normally leave the footprint behind to save weight (I do), it is useful to have when car camping and will extend the life of your tent. Also, many tents are designed with a fast-pack option, allowing you to use only the footprint, poles and rainfly to create a very light (though not bug-proof) shelter.